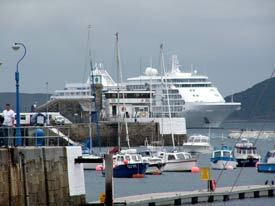 ABOVE: The Silver Whisper anchors just outside St. Peter Port's harbor. The town of St. Peter Port is both the capital and the main port for Guernsey in the Channel Islands. During our visit in August, the small harbor and its marinas were filled with pleasure craft, fishing boats, a lifeboat, a seagoing ambulance, and excursion boats. Several ferry lines provide service to England and France, with other ferries connecting Guernsey to the nearby islands of Jersey, Alderney, Herm, and Sark.